East and Southern Africa offer some of the most beautiful and pristine beaches in the world. From warm, Indian Ocean destinations such as Kenya, Tanzania and Mozambique to some of the chillier, wilder coasts of South Africa and Namibia, visitors can enjoy a wide range of settings and activities off the mainland coast. Africa also is home to a number of exquisite islands including Zanzibar, Seychelles and many more. Click below to explore. Contact us to find and customize the perfect beach destination safari for you or call 303-778-1089. Let us customize the perfect African beach getaway for you! Below are some of our inspirational itineraries. Contact us today or call 303-778-1089 to learn more about how we are able to customize the perfect African beach getaway just for you! In our estimation, Zanzibar offers the best combination of culture, history and gorgeous beaches. With clean, white-sand beaches and warm, turquoise water, it’s a beautiful place to end a Tanzania safari, along with it’s neighbors Pemba and Mafia islands. Also part of the Swahili Coast, Lamu is paradise in East Africa. Snorkeling, scuba and relaxing reign supreme here. Also inviting are its neighbors Malindi and Mombasa. Some of the most stunning and gorgeous beaches in Southern Africa are in Mozambique. A Portuguese heritage sets it apart from neighboring countries. From the incredible and wild coastline near the Cape, to the warmer surrounds further North, South Africa’s beaches offer a wide range of activities including surfing, whale watching (seasonal), scuba diving, great white shark cage diving and more. Namibia’s coastline is the most dramatic in Africa. Frigid Atlantic waters meet the great Namib desert here, creating a foggy, mysterious coastline hiding seal colonies, sand bars, shipwrecks and more. 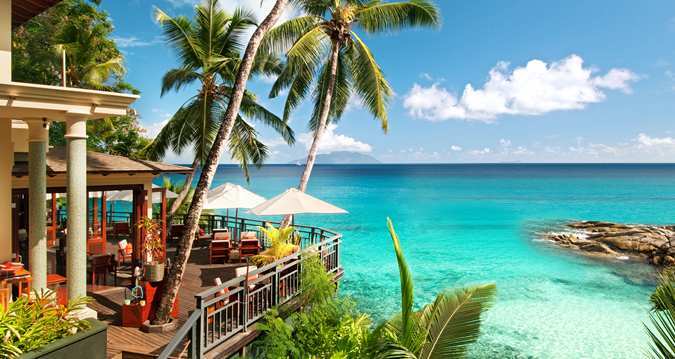 Probably the best known of Africa’s island countries, Seychelles is a beach-lovers dream. It’s many islands offer a wide range of scuba, snorkeling and fishing activities.